Recently a Facebook friend posted a link about college costs, and I followed it to read the article, “Students in Debt, Professors in Poverty – What’s Going Wrong?” because I’ve thought a lot on this subject and talk to other people who think about it a lot. The article turned out to address a single issue: the replacing of fulltime faculty with adjunct instructors, most with equivalent qualifications in terms of degrees but paid only per course, with no benefits and no future job security. None of this was news to me. I’ve taught as an adjunct and know the reality of it from the inside. The article calls it the “subcontract business model.” Okay, but what about those students in debt? What about that part? Focus on the orchard or focus on the trees? Once you know what to look for, the information is not hard to find. The first article I turned up in my search is very detailed and might tell you more than you want to know – but then, you don’t have to read every word. It’s definitely worth a look. The shortcoming of the picture presented there, in my opinion, is that it only looks back as far as 2007. The second story I’ll direct you to, "State Funding: A Race to the Bottom," is more focused on state funding and goes beyond a look at “pre-recession” levels, going back to 1975 to present a much longer history. Here we learn that since 1980 48 states have reduced state funding to their own universities by anywhere from 14.8% to 69.4%. Extrapolation from data can be a lot of fun. Take, for example, one of my favorites, the rising number of Elvis impersonators. Extrapolating from the trend one can forecast a year in which all Americans will be Elvis impersonators. The trend in reducing state support for education is not nearly as funny. By the way, the phrase "race to the bottom" fits so many areas of human economic life these days, doesn't it? Work harder, accept less pay, or lose your job! It's easy to get distracted from the big picture. Adjunct faculty are hardly the only ones hurt by funding trends in higher education. Yes, those of us with higher degrees are exploited, but, much more to the point, states are no longer seriously investing in higher education. The term "state" university is becoming a misnomer. The school bears the name of its home state and may have a board elected by voters at the state level, but increasingly low levels of state funding shifts the burden of tuition more and more to students and their families. These are now largely private schools flying under state flags. The cause for tuition hikes may be news, but the consequence is familiar to all informed Americans: astronomical levels of student debt. Some economists even think the idea of student loans as investment is a replay of the housing bubble. And as usual, families and students with the least are hurt the most. Libertarians and others who have been trying to "get government out of education" have been winning the day behind the scenes, privatizing higher education behind our backs, and our children and grandchildren are paying the price. Will our entire country soon find itself paying the price, as more and more jobs requiring higher education cannot be filled by educated Americans? How do you see this complicated picture? And were the funding facts news to you? Where are we going? Is it where we want to go? This is an important topic, one I'd like to discuss at greater length, but at the moment I need a break. Time to turn once again to Chaucer and his entertaining fourteenth-century pilgrims. The book friends I’ve referred to in the past, collectively, as our intrepid Ulysses reading group have now designated us a reading circle. I’m unclear on whether or not Ulysses is still part of its title (if it ever was), and it doesn’t matter, really, what we call ourselves. Getting together and challenging ourselves and reading and discussing important works in a supportive environment is our raison d’être. From Don Quixote last spring, we eased our way through Uncle Tom’s Cabin and Hemingway’s Nick Adams Stories in recent, busier months, and now that fall is here and schedules a bit freer, we agreed that our project for November would be Chaucer’s Canterbury Tales. It seems like a good follow-up to Dante (an earlier winter’s reading) and Cervantes, though because I’ve been reading a couple other books (Infinite Jest, by David Foster Wallace, and Nineteen + Conversations with Jazz Musicians, by Garth W. Caylor, Jr.) I have not yet made it past Chaucer’s Prologue, but already I've been musing on the notion of seasonal pilgrimage. 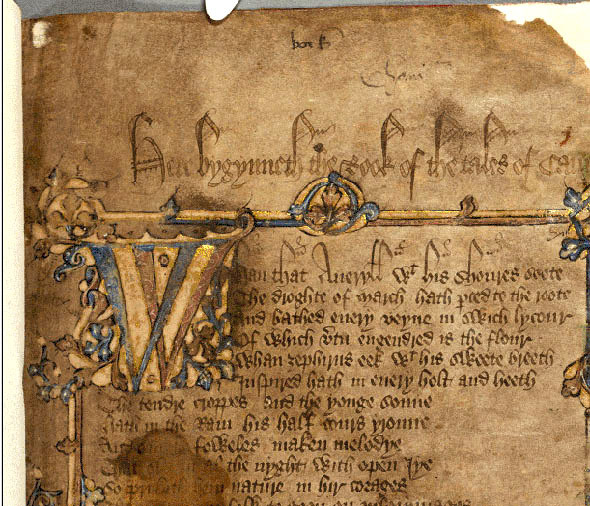 Spring, the season that found Chaucer’s pilgrims on the road to Canterbury, is said to be appropriate for such travels because the earth’s annual renewal calls human beings to a spiritual renewal, also. That strikes me as a very lofty view. I can’t help suspecting that here in northern Michigan, at least, cabin fever is as much a factor as spiritual renewal: We’ve been stuck indoors all winter! Let us out! But the itch for the open road strikes in the fall, too, perhaps in anticipation of impending cabin fever. Once summer is over, many summer residents start packing for winters in Florida, Arizona, New Mexico, California or (old) Mexico, and we know people from Northport who go as far away as Hawaii or Istanbul. Seasonal migration has always been a feature of human life on earth. David and Sarah and I certainly enjoyed our winter away last year. Was it a pilgrimage we made to the Southwest? It was a long cross-country trek! This year it looks as if we’ll be sticking it out in the old farmhouse, as we’ve done many times before. Still, we did make it to the U.P. for a little getaway a couple weeks ago, and after four decades of making the trip, it does begin to feel like a pilgrimage, as (in addition to exploring new roads and places) we revisit scenes sacred to memory and friends (and traces of friends departed) who have iconic status in our lives. So, winter elsewhere, short autumn getaway – those are two solutions to the Up North longing for the road that comes over Northerners at this time of year. Another is simpler and involves nothing more than short trips around our pleasant peninsula, blazing with color before the scenery is reduced to a more restricted winter palette. Day trips are very good, when they can be arranged, but so are glorious stolen hours before the start of a regular work day. Sarah and I have been finding much joy recently in our outdoor mornings, finding new places to walk in addition to our old, favorite roads. Do my morning wanderings count as pilgrimages? Not, I guess, if a pilgrimage must be long. But “sacred place” and “act of devotion” certainly fit my pantheist sensibility. This beautiful world! The obligation I feel to pay attention to it is especially strong in the autumn of the year, as the air and water grow colder and days shorter. Lovers of Leelanau County who live elsewhere have been making pilgrimages of their own during the past few weeks. Like squirrels hiding nuts away, we are all harvesting these last bright, sunny days and storing beautiful memories – spiritual riches -- for the winter ahead. As the proud owner (pack leader?) of two black Lab mixes, I was intrigued by this book's title. Rescue Road: One Man, Thirty Thousand Dogs and a Million Miles on the Last Hope Highway. Thirty thousand dogs? Really? What possessed Peter Zheutlin, a freelance journalist and author, to write a book with this title? I often wondered how dogs ended up in shelters and how far they'd traveled to get there. 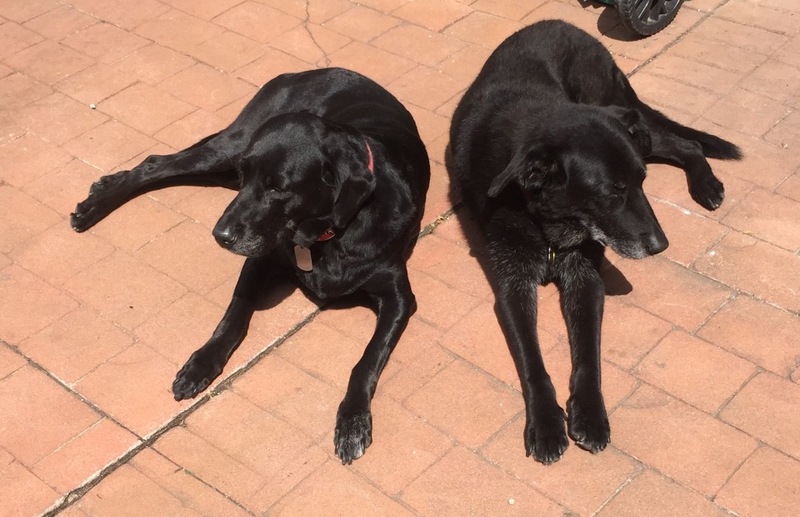 The only dogs anyone in my family has ever had have been rescue/shelter dogs. I read the book hoping to find out answers to those general questions as well as the one I had about the title. Zheutlin, the author, had caved in to his family's requests for a dog and found one online – a rescue - to adopt. He and his family found Albie through an Internet search (the way my husband and I found our girls). Albie was in a shelter in Louisiana, and Zheutlin and his family were in Massachusetts, so Albie would come north with Greg Mahle via Greg's Facebook page, "Rescue Road Trips," riding along with many other dogs awaiting better homes in northern states. Peter and his wife followed Albie's progress north on Facebook, seeing photos from stops along the way and reading updates as the trip progressed. As Albie settled in with his new family, Peter Zheutlin continued to follow "Rescue Road Trips" on Facebook. He wanted to meet Greg Mahle in person to find out more about his service to rescue dogs and reasons for doing this work. Eventually, over a year's time, he rode with Mahle on three rescue trips, meeting people along the way who support rescue efforts in many ways: picking up dogs from shelters, fostering dogs, meeting the road trip truck to walk dogs, and cleaning kennels on the necessary stops along the way. There are also the veterinarians who donate time and talent to bringing injured and sick dogs back to health so they can be adopted. Zheutlin learned how, for Mahle, having a dog as a young boy changed his life and inspired him to save other dogs. The book was sometimes heartwarming and at other times heartbreaking. I cried tears of joy and tears of sadness throughout. People who care for the dogs on the road to their new homes are saving the dogs' lives, giving their time freely and going out of their way to help dogs find “forever” homes. Greg himself has often been on the verge of having to stop his efforts due to money difficulties resulting from truck repairs and fuel expenses. His wife makes sandwiches for his trips so that more money is available for the dogs. Contrast this concern with the author’s report of cultural attitudes in the South: In most of the South, dogs are considered property and live outdoors. If they are injured or can't hunt/guard the property, etc., they are abandoned and left to fend for themselves in the wild. Conditions in many shelters in the South are abysmal. They are poorly funded and have a high rate of euthanization. This is the reason so many dogs travel from the South to the North: they will have a much better chance at a good life in the North. 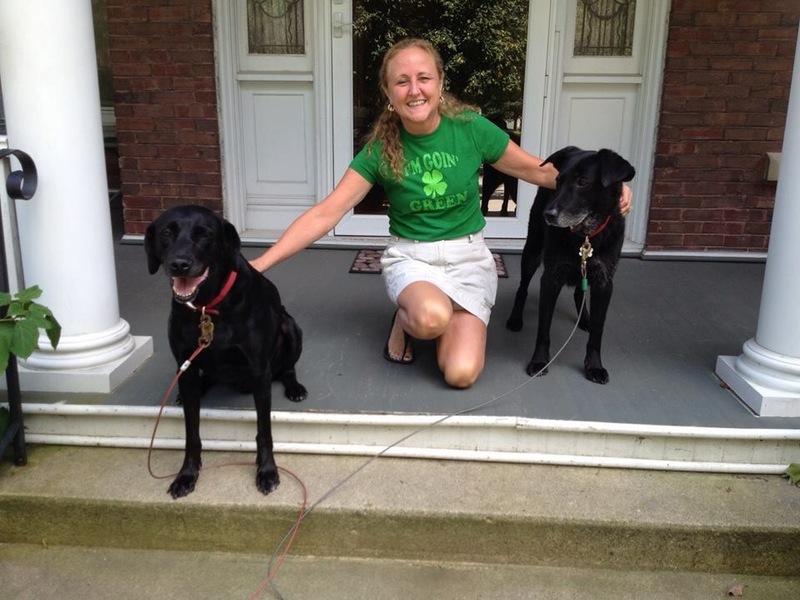 People helping the dogs get from shelters to new homes say theirs is a work of love. As Zheutlin writes of one rescuer's work: "Move this dog here today even if she doesn't know where he'll go tomorrow. If she needed to have a complete plan from the outset she might never save a dog. It's not about logic; it's about love." All along, I knew there would be the point at which Zheutlin writes about what the rescuers call "Gotcha Day." And I knew I would cry tears of joy as dogs finally became part of waiting families. People waiting for their dogs bring welcome signs and greet the truck excitedly. Dogs are brought out one at a time by Mahle, who gives papers to the new owners and says, "Thank you. Thank you for saving a life." I hope anyone considering getting a dog or anyone who has a dog or once had a dog will read this book and get caught up in the lives of Mahle and the rest of the helpers on his road trips and follow them on Facebook, as I now do. I hope that anyone who is thinking about getting a dog will realize how much all shelter dogs, like the dogs Greg Mahle transports, need loving homes. And I hope they adopt a rescue dog. Today's guest reviewer is Bettie Komar of Joliet, Illinois. Bettie is a retired public school teacher who worked as a reading specialist in both middle school and lower elementary grades. She currently teaches as an adjunct instructor in the College of Education at Lewis University in Romeoville, Illinois -- and she is one of my two sisters! Guest reviewer with her "girls"
Some days, everything seems to go right, just when you've worried the most. I mean, start with a rainy, cold morning with an author event scheduled for noon. In the middle of the week. In the fall. Did I mention rain? What if the rain kept up? What if only two or three people came for the reading? Then skies clear to cloudless blue, the author arrives, and a crowd assembles. 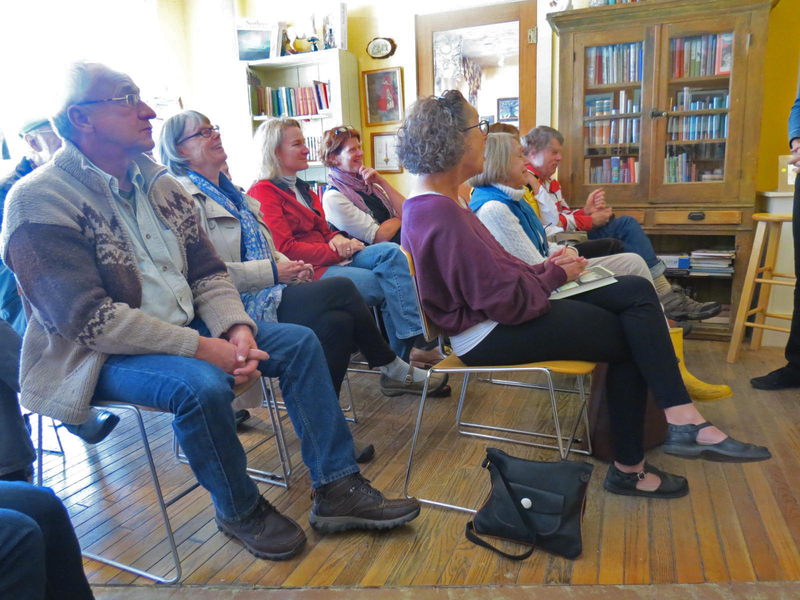 The visiting author – Bonnie Jo Campbell, in Northport for her third time at Dog Ears Books -- is frank, funny, honest, and engaging, and the audience is enthralled without being intimidated. There are questions and lively conversation. People buy books and have Bonnie sign them. 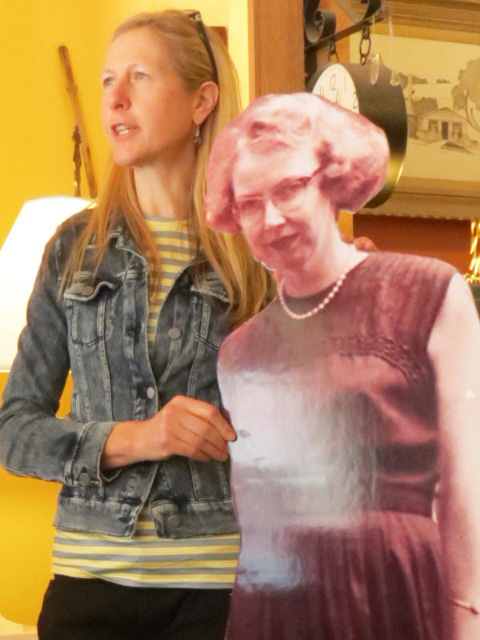 Lots of pictures are taken with big cutout figures of Flannery O’Connor and Joyce Carol Oates, two authors near and dear to Campbell’s literary heart. Contagious smiles and laughter fill the air. 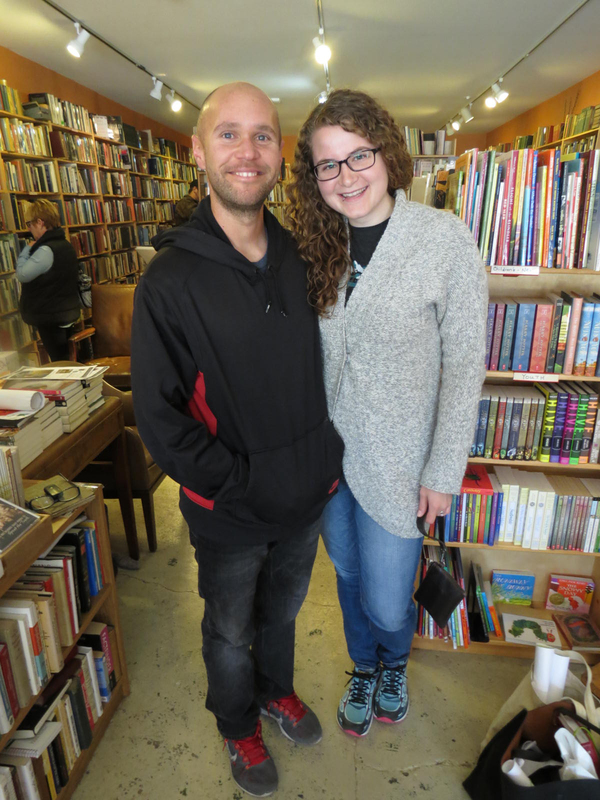 In the middle of everything else, a couple married just last Saturday and honeymooning on Spider Lake near Traverse City finds their way into the bookstore. She works at Literati in Ann Arbor. They were touring M-22 and could not pass by Dog Ears Books. 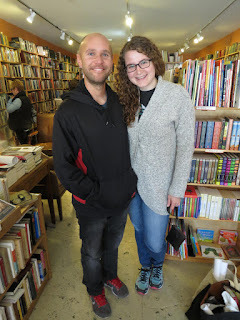 A bookstore honeymoon! 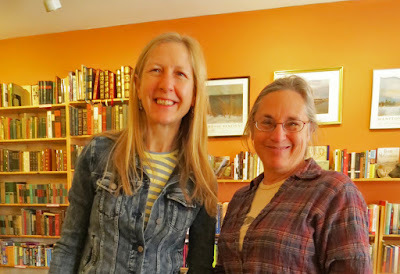 Plus, for the bride, a fortuitous meeting with author Bonnie Jo Campbell, who will be at Literati Bookstore on October 20. Bonnie Jo Campbell says “dang,” can you believe it? I may have caught the habit from her. She said it a couple of times last night onstage at the Opera House in Traverse City, where she was part of the National Writers Series first-ever Bookmania Week. Sounds like something a cowgirl would say, doesn’t it? I feel honored to be a small part of Michigan’s literary community. And it is so much dang fun, too! Another busy week is underway. 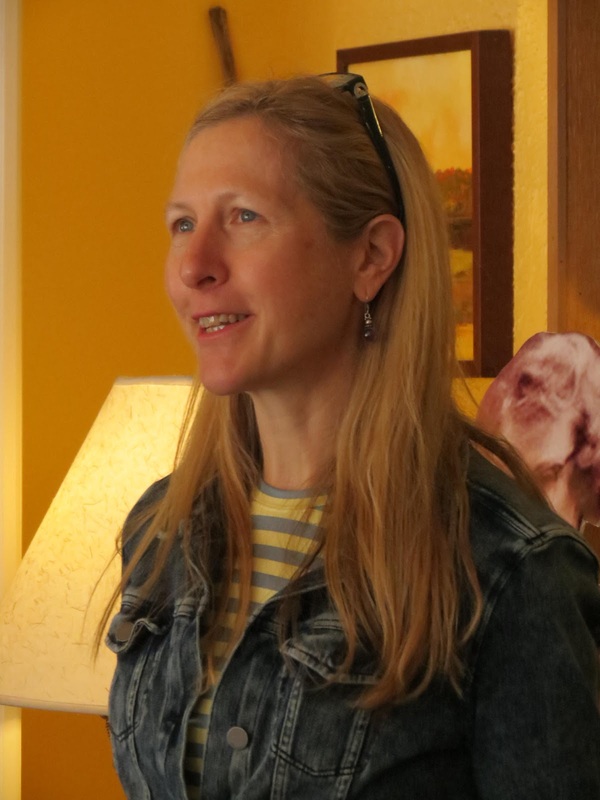 Tonight Bonnie Jo Campbell will be at the Opera House in Traverse City, as part of the National Writers Series Bookmania Week, and tomorrow she will be here in Northport at Dog Ears Books. She's been getting national press right and left, and I'm pinching myself to confirm that I'm not dreaming. She's coming to my bookstore -- again? I am so lucky! On Friday we're expecting family and hope to arrange for a little sunshine by then, but even under cloudy skies the fall colors are coming on, as you can see from these scenes along my morning commute. Sumac is blazing, as are many maples, and tamarack and popples are starting the annual shift from green to yellow in Leelanau County, as they were last week up in the U.P. Sunshine or clouds, summery or chilly, whatever the weather, it's always good to be with writers we admire and friends and family we love. We had one day on the road, two full days in the U.P., and a fourth day coming home. Ours was a short getaway this year but, as always, packed full and brimming over, overflowing with memories as well as with beautiful new sights. Memories make every mile dense with associations of other years, absent friends, friends no longer with us except in spirit. Since H-58 is now paved between Grand Marais and Munising, we braved washboard (not as bad as we remembered from our last time, long ago) on the Adams Trail in search of excitement. Finding the beaverworks was exciting, but I've always loved the simple expanses of seemingly empty cutover land, the vast stumpfields of the Kingston Plains. I did not try to find the bearing tree again this year but thought about it as we neared the intersection of the Adams Trail and H-58 on our way to Melstrand and on to Munising. One big change since the road along Lake Superior was paved is that there are very few places to pull off. Lots of "No Parking" signs. So we took advantage of one official parking lot and steps down to the water. Sullivan Creek is not as big and noisy and exciting as Hurricane River to the east, but the carving action of water through sand is always beautiful and always in flux. Clouds only made the light more glorious on the water. But we don't need adventure and new scenes filling our days. Just hanging out in Grand Marais fills us with contentment. Our other day trip was to the east of Grand Marais, where paving runs out fast on H-58, and it's definitely washboard but worth the jolting, particularly for the lovely little rivers the road crosses. Leaving is always difficult. Our time having been so short this year, we left without hurry, stopping along the way to appreciate scenes of "ordinary" Upper Peninsula splendor before ducking east to wander roads with wonderful names -- Ten Curves Road, Sandstone Road, Hiawatha Trail -- to St. Ignace. We hadn't called ahead so could not blame my friend Mary for not being in her bookstore when we came by. After all, I was not in mine back in Northport, was I? I left her a note and hope she found it. The triumph of this year's trip for me was wringing an admission from David, at last, that there is a difference in pasties. They are not all the same! (How could he ever have thought so?) My favorite pasty shop had sold out minutes before we got there on Sunday, so I tried one from down the road, electing to give it a try since it was made with venison. The gamey taste of the meat was nice, and there were rutabagas (not a pasty without rutabaga) but no onions, and overall it was a little too dry for my taste. I like a slightly greasy pasty. So on the way south, we found Lehto's open, and I got a "hot one" to eat right away and a couple of "cold ones" to take home. Big, golden-brown crust, sirloin, potatoes sliced paper thin, onions and rutabagas for taste, very dense and heavy and moist -- this is my favorite pasty, and taking a couple of bites with the memory of the pasty from three days before still sharp, David at last acknowledged the difference. But his heart was set on a burger from Bentley's, our favorite St. Ignace restaurant. We were too late in the year to catch the big car parade -- or the big truck parade -- or (my favorite) the tractor parade, but there is always plenty to see from Bentley's front window, with ferries leaving for and returning from Mackinac Island just across the way. Bentley's is our last stop before the Mackinac Bridge. The only book I took with me was the collected stories of Ivan Bunin. It was such a big book that I knew I wouldn't need anything else, and indeed I only got halfway through the stories, but they were perfect for the trip. More on that some other time. We came home to learn that a dear friend had died the day before we started on our trip north. The thing is, I was writing letters to her in my head every day that we were gone and planning to write and send a real letter when we got home. For me, she was alive during those days. Do you understand?